Ragtime: A Musical and Cultural History A history of ragtime music, of the ways in which the music was perceived, and how it has been studied. Exploration of areas for ragtime research and an examination of ragtime in New York City. Ragtime research is all over the map. On one side of the map reside an established group of researchers and writers who have made a career of repeating the old clichés, half-truths, and outright fictions. Some newcomers, lacking the insight and imagination to see beyond the bluster, continue the pattern of perpetuating baseless stories. In another part of the landscape we see resourceful investigators who do the legwork required to illuminate unsuspected facets of a history that is obscured as much by the unthinking repetition of unfounded myths as by the unspoken, forgotten truths. Among the latter are several who are little known and unheralded, but who have been unearthing nuggets of splendor. One would think these latter researchers would be celebrated and encouraged; in some circles they are. But a significant segment of today’s ragtime community prefers to retain the familiar, prefers the comfortable myths to any upsetting new versions of the ragtime story. 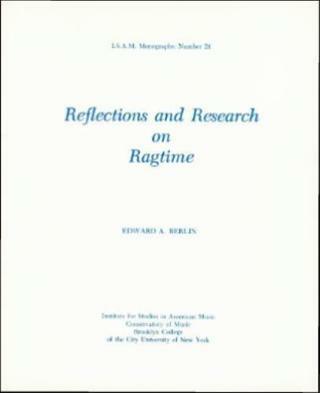 At the root of this seemingly perplexing attitude is the pioneering study of ragtime They All Played Ragtime (1950), by Rudi Blesh and Harriet Janis. 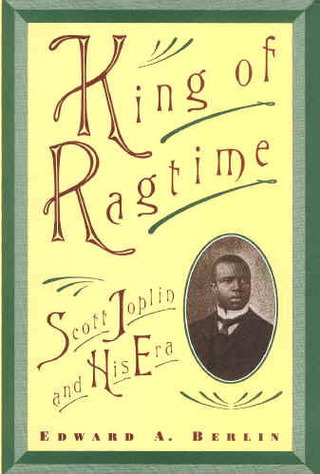 This remarkable book, often called “the bible of ragtime,” has enthralled, enlightened, and inspired generations of ragtime enthusiasts. The authors had the foresight to locate and capture the words and stories of surviving ragtimers and cast them in a beguiling form that, more than a half-century later, continues to work its magic on new readers. 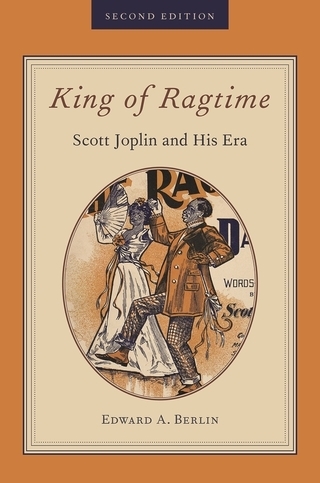 Though a few, isolated articles on ragtime had preceded publication of this book, They All Played Ragtime, at least figuratively, is where ragtime research begins. The book also has undoubted flaws. It expresses attitudes that clearly reveal leftist political ideology of the 1930s, too sharply drawing and exaggerating class distinctions between the purity of “folk” inspiration against the commercialism of “Tin Pan Alley” craft. Its documentation is haphazard and sloppy; quotations are often mistakenly connected to the wrong sources, and some quotations are even taken out of context, misleading the reader to believe that statements about vocal ragtime refer to piano ragtime. Still, the power of the book and its tale remains. Most successive writers merely restate what they read in They All Played Ragtime. The few who have tried to present different views may have difficulties in finding acceptance. This is the paradox: the book that has been the greatest spur to ragtime research is also the greatest impediment to the acceptance of new ragtime research. They All Played Ragtime casts a long shadow that tries to block new light. A member of Scott Joplin’s family, a descendant of one of the composer’s brothers, recently congratulated me for my honesty, for revealing the composer’s shortcomings as well as his greatness, for showing him to be human. I was at first taken aback: honesty is easy. But after reflection, I understood the compliment: many who go under the name of “scholar” would more easily fit the category of “politician”. They act as though proving one’s case is more important than finding the truth. In my observation, too many writers and symposium speakers form conclusions before examining the facts; should the facts lead in a direction not desired, the facts become expendable. That is not honest scholarship. I have tried to be forthright in my own scholarship and have assumed that my writings might be viewed by some as a positive model. I hope, with this website, to start a discussion on scholarship, on what constitutes honest, fruitful and exacting scholarship, and on how one can most effectively present the results of such research. Read further about my books. 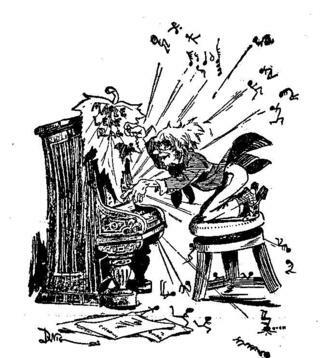 An advertisement by John Stark, spoofing the ubiquitous German music professor befuddled by ragtime's intricacies. A logo used by John Stark (stork = Stark? ), ragtime's foremost publisher.